In this Digital Era, every family is full of all kinds of digital media devices to record every exciting moment sharing with your families. Then how to transfer and play them on your computer is the attendant difficulty. So video conversion has already become a must know for every digital media fans. There are many types of video formats in the world of digital media. Not all of them can be played properly with your media player on PC and Mac respectively because it does not support the video format such as MKV, AVCHD (.mts, .m2ts), WMV, MOV, FLV, H.264 and VOB. Such cases are common, and free video converter software is a one-stop solution to deal with such situation accordingly. The second thing is to see if it is easy to use and how fast it convert. No one is willing to wait for half a day to convert one hour video. For beginners, user-friendly interface is also an important factor should be watch out. You must make sure you can use it as your will. The third thing is free and clean. For some people, this might be the first thing. Free video converter software without any virus, spyware is right what you need. It is painful if important files are lost by virus attacking. Lastly, for some users, they probably prefer to software that has the most common settings for its default settings, which is still powerful enough for you to customize its features accordingly. Thus, you can change video file size, effect video, etc. According to the result found by Google Searching, quite a lot of free video converter are available seems to be able to solve your problems. However, few of them could work as it advertised. After taking a careful look at those software, I shortlist several suitable free video converter to have a try. Among them, WinX Video Converter is one of the best free video converter with powerful functions. 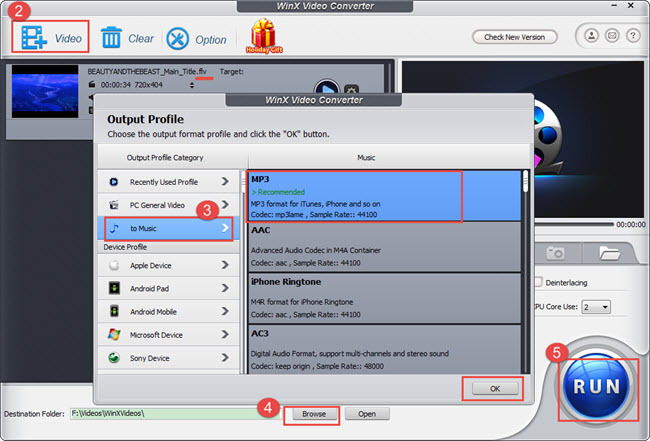 WinX Video Converter, as a totally free video converter enjoying high popularity in the market. It support converting all popular video formats, such as: AVI, FLV, WMV, RMVB, WMV, MPEG, MP4, etc. With user-friendly interface, it is very easy to use for users of all level of experience. This free video converter also features the ability to its advanced functions, like grabbing screenshot, separating audio from video, batch conversion, adjusting video/audio parameters and changing output video quality and size. You can download WinX Video Converter to have a try. If there is any problem when using this free video converter, you can check the step by step tutorials to convert video by this free video converter. For Advanced Needs: If you have higher requirements on video conersion, for example, HQ HD video conversion, faster speed, higher quality, more formats supported, you may give WinX HD Video Converter Deluxe a try, which can convert all kinds of videos (up to 370+ video audio Codecs), including MKV, M2TS, MTS, AVCHD, H.264/MPEG-4 AVC, AVI, MPEG, MP4, WMV, MOV, FLV, RM, RMVB, WebM, Google TV, etc. Besides, it can download online HD videos from YouTube, DailyMotion, Facebook, Vemo, Vimeo, Vimeo, Vevo, Break, MTV, Pandora, etc., and make slideshow videos. The all-in-one video software that can convert multi-track HD videos AVCHD, MKV, TS, H.264/MPEG-4 AVC, SD videos AVI, MPEG, MP4, WMV, MOV, FLV, RM, RMVB, etc. Users can painlessly convert any videos for iPhone, iPad, iPod, PSP, Surface, Android, Samsung, Galaxy, HTC, Kindle Fire, DVD players, etc. It also can download online Dailymotion/Facebook/YouTube videos, make picture slideshow, and merge/crop/trim/subtitle videos, etc.